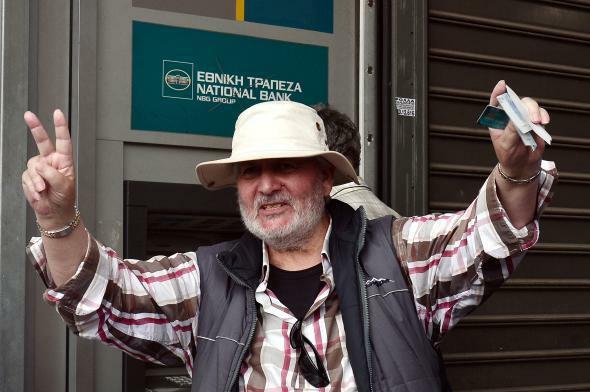 A man jokes with media after withdrawing the limit of 60 euros at an ATM machine in central Athens on June 29, 2015. Update, 10:15 p.m. The headline has been updated to reflect the fact that Greece missed the payment and has been declared “in arrears” by the IMF. Original Post: Greece needs to cough up $1.8 billion by 6 p.m. ET Tuesday evening, (1 a.m. in Athens) to avoid the dubious distinction of being the first developed country ever to default on a loan from the International Monetary Fund, joining a club that includes Zimbabwe, Cuba, and Sudan. If it finds itself in arrears to the world’s financial backstop, Greece would immediately lose access to IMF resources and could eventually be kicked out of the fund entirely. Today is also the day when Greece’s bailout program expires. Tsipras rejected the latest bailout proposal from Greek creditors over the weekend and stunned the world by announcing a public referendum on the deal to be held this coming Sunday. The prime minister plans to vote “no” in the poll, which other European leaders have made clear they view as a referendum on whether Greece will remain in the eurozone, though Germany’s finance minister suggested today that there could be a way to keep Greece on the single currency even with a no vote. Late on Monday night, European Commission President Jean-Claude Juncker made a last-ditch proposal to salvage negotiations, offering concessions on payments to the poorest Greek pensioners in exchange for Tsipras agreeing to the rest of the terms of the bailout—which he already rejected—and campaigning on behalf of the deal in Sunday’s referendum. The offer had a deadline of midnight last night, but is apparently still being discussed in Athens. Extending the bailout would allow Greece to make its payment to the IMF. Nonetheless, it seems unlikely that Tsipras, after having taken a fairly absolutist stance against the austerity measures demanded by Europe, could walk back now. The bailout is now in the hands of Greek voters, who by and large favor staying in the euro but feel trapped by the demands of the country’s creditors. A large “no” rally was held in Athens on Monday, and a rival, pro-Europe rally is planned for today. The German government, which has essentially written off efforts to negotiate with the Greeks, found Juncker’s last-minute offer “irritating,” according to one senior lawmaker. After this Sunday, the next key date to watch is July 20, when a 3.5 billion euro payment to the European Central Bank is due. If there’s no bailout program in place by that point, the bank will cut off Greece’s banks. Markets seem relatively unpanicked by the likely default, potential Greek exit from the eurozone, and possible risk of financial contagion. The euro was up slightly against the dollar today.